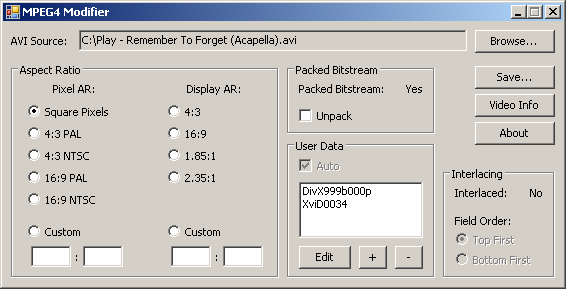 Modifies a MPEG-4 ASP video (XviD, DivX) without re-encoding (change aspect ratio, edit userdata, remove or add packed bitstream, and change interlaced field order). It can also show information about the video such as the amount of I/P/S/B-VOPs used, whether or not QPel/GMC were used, etc. The video must be in an AVI container. Marked as system DPI aware to fix blurry UI with high DPI settings.